KCET 2018 Result has been declared. The result has been announced in a press meet by Chief Secretary of Government, Department of Medical Education. The result of KCET discloses the score and merit of the candiates. Karnataka Examination Authority (KEA) has announced KCET Result on kea.kar.nic.in. Candidates can check the result of KCET 2018 from this page by entering the registration number. Candidates will have to download the result because it will also act as rank card and will be needed during counselling. The candidates successful as per the KCET result will be called for document verification followed by counselling. 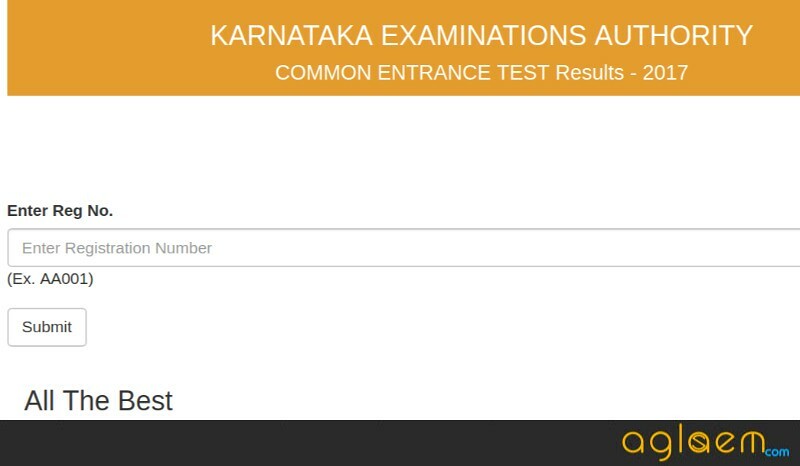 Candidates can check complete details on Karnataka CET 2018 Result from this page. Latest: UG CET -2018 AYUSH (ISM&H) for NEET Reduced Lower Percentile Allotment Result has been released. Scroll down to check the same. Click here to check UG CET -2018 AYUSH (ISM&H) for NEET Reduced Lower Percentile Allotment Result. Click here to check KCET 2018 Supplementary Rank List. Click here to check List of Jammu & Kashmir Migrant Candidates who verified their documents for Veterinary Rank. Click here to check List of Jammu & Kashmir Migrant Candidates who verified their documents for Engineering Rank. Click here to check the rank list of centre wise Karnataka candidates Architecture. Click Here to check the list of eligible candidates under special category NCC. Click Here to check the list of not eligible candidates under special category NCC. Click Here to check KCET 2018 Result. Click Here to enter your CBSE / CISCE / 10+2 Marks. Click Here to check the instruction for Class 12 Marks Entry. After result – KCET Document Verification, and Option Entry. How to Check KCET 2018 Result? It will lead to a portal, that shall appear as shown below. Enter Registration Number to access the portal. Check and donwload the KCET Result 2018. The candidates need to obtain minimum marks in order to qualify the entrance test. Those who will obtain marks equal to greater than the cut off will be declared as “Qualified”. The cut off for KCET 2018 is not yet available. However, the students can check the previous year closing rank as given in the table below. 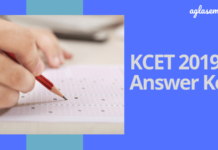 How KCET 2018 Merit List is Determined? Firstly, the marks in Biology / Mathematics shall be taken in consideration. If the tie still persists, then the marks of the candidates in Chemistry / Physics will be used. The tie is not broken even after this, then the marks in respective subjects in the Qualifying examination will be used. As a last resort, the age of the candidates will be considered. The elder candidate will be allocated higher rank. If the score of the candidates in NATA are equal then the merit shall be determined on the basis of marks secured in Mathematics, of Qualifying exam. The tie is still there, then the age will be considered and elder candidate will get the higher rank. Merit by Draw of Lots: KEA will use draw of lots method if they above mentioned ways to break the tie fails. As per this, the merit shall be allocated by draw. It will be purely on luck basis. 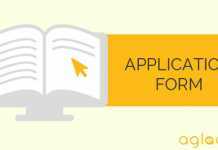 How To Submit Objections for KCET 2018 Result Sheet? After checking the results, if candidates have some query or objections related to the declared result such as changes in the Q.E marks, version scores, NEET/NATA scores etc except the scores obtained in the common entrance examination then the candidates will have the option to submit their objections within the three days from the date of the declaration of CET 2018 results and after that the ranks will be published for those candidates again. After the declaration of result, the KCET 2018 merit holders will be called for the document verification round. The verification of documents will be take place in 15 notified centers. After the verification, successful candidates will get a verification slip. Only after that the they will be able to enter options / choices for course and college. KCET 2018 Document Verification – The dates for verification are yet to be announced but it will be held in a window of 16 days. In it, the candidates will be called in the following order of rank. Secret Key – Candidates who will get through the document verification round will be issued Secret Key. With the help of the key, the candidates will be able to register for counselling and submit option choices. Registration and Choice Filling – The candidates will be able to register and submit the choices online. To register, candidates will have to enter basic details like name, KCET password, etc. The choices must be submitted in the order of priority. Seat Allotment – KEA will allocate seats to the candidates on the basis of KCET 2018 Merit. The seat allocation will be done online and the candidates will have to either accept the seat or go for the next round of counselling. KCET is a national level examination, which is conducted by Karnataka Examination Authority. It is a state level examination, which is conducted for intake of candidates in UG engineering, pharma, B.Sc, and other courses. Only the colleges of the state grant admission on the basis of KCET 2018 Result.